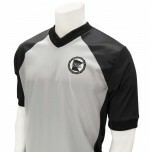 This referee shirt blends in with teams uniforms who wear grey. If you have a big belly, makes it look like you have a really big belly. MN should have stuck with a classic striped shirt. It is $54 dollars with shipping.